During my first year in yeshiva, I fell into an obvious trap that I later learned to avoid. That trap is taking seriously a rule that no one else follows. Yeshiva College requires (or at least in my day required) students in the Yeshiva Program to study a large section of Shulhan Arukh with Mishnah Berurah each semester and sit for a comprehensive test at the end of the term. So in my first semester, I took the requirement very seriously and set aside a good deal of time every day to prepare for this exam. Little did I know that very few students take the requirement seriously. In later semesters, I still adhered to the curriculum but not as thoroughly as in that first semester. The section assigned was all of the laws of Yom Tov. After studying it carefully, I reviewed as the exam drew near. On the day before the test, I took the Kitzur Shulhan Arukh, R. Shlomo Ganzfried’s summary of the Shulhan Arukh, and used it to review the related laws. To my great surprise, R. Ganzfried’s summary is much more than just an abbreviation of the Shulhan Arukh. It is an original work that is actually much stricter than the Mishnah Berurah. In fact, I was extremely dismayed by the work’s stringency and set it aside. As the years passed, my relationship with the Kitzur developed and I think I now have a more mature understanding of its nature. I have learned to appreciate it for what it is and not expect it to be something else. Originally published by R. Shlomo Ganzfried in Ungvar, Ukraine in 1864, the work was in many ways an attempt to fill the breaches of Reform by making available to the masses a simple and concise guide to Jewish practice. The book was wildly successful, seeing 13 printings in the author’s life and hundreds subsequent. It has become a staple of rabbinic scholarship. Even in the Conservative synagogue I attended as a child, the rabbi taught from the Kitzur during se’udah shelishis on Shabbos! 1. The Kitzur represents normative Orthodox practice in the greater Hungarian region in the mid-nineteenth century. Today’s Jewry, outside of Hasidic circles, generally follows other rulings. In particular, the Kitzur is generally very strict while other works that are more mainstream — Mishnah Berurah, Hayei Adam, Arukh Ha-Shulhan — are frequently less strict. This can be seen most cleary in the 1978 edition of Kitzur Shulhan Arukh with the rulings of the Mishnah Berurah printed in footnotes. The notes almost always point out leniencies. Just two examples from the laws of Yom Tov (ch. 98): The Kitzur prohibits the lighting of a yahrtzeit candle on Yom Tov (par. 1) and the burning of wood to warm a house (par. 29), both of which the Mishnah Berurah — not known itself as a particularly lenient work — permits. 2. The Kitzur was intended to relay laws relevant to daily life, including those outside the Orah Hayimsection of Shulhan Arukh. Because life has changed in many significant ways since R. Ganzfried wrote his classic work, the book often focuses on areas that are not particularly practical today. One example is his emphasis of the laws of kosher slaughtering, something that is no longer relevant to the average Jew now that slaughtering has been centralized. 3. As an abridged book of laws, the Kitzur intentionally neglects the “why”s of religion. What is this practice supposed to mean to me? Why do we do this? To a highly traditional laity that inhales such issues from birth, these questions do not need to be addressed in a systematic manner. And even if they did, this would not be the book for it. If it were, the book would become overly long and unwieldy, thereby undermining its primary goal. For these reasons, the Kitzur Shulhan Arukh is an entirely inappropriate book for the newly observant. Translations of the work into English (I & II) are, in my opinion, to be lamented. What is needed is an adaptation. R. Gersion Appel has attempted to remake the Kitzur in his The Concise Code of Jewish Law. 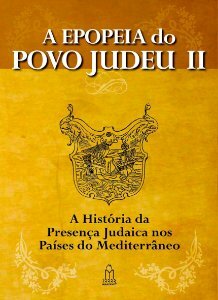 Based only loosely on the Kitzur, the book condenses contemporary Jewish law, focusing on matters relevant to the average Jew and incorporating more mainstream views. If done successfully, this alleviates the first two concerns. However, the book is still lacking in explanations of the important “why”. Particularly in today’s age, people want to know what meaning there is in observance and why God wants us to follow these laws. Rabbi Asher Meir has tried to fill this lacuna with his new book Meaning in Mitzvot. Following the order of the Kitzur Shulhan Arukh, Rabbi Meir offers insights into the meaning behind various observances and the symbolic significance of the laws. Culled from the literature of ta’amei ha-mitzvos — the reasons for the commandments, that includes the Sefer Ha-Hinukh and the writings of R. Samson Raphael Hirsch, R. Meir’s explanations provide both background and depth so that the novice will see beyond the “do”s and “don’t”s and recognize the spirituality that encompasses Judaism’s ritual observances. Those familiar with this literature will see much that he has seen before, but will still find occasions of profound insight and originality. Given the generally rationalistic and symbolic sources of the book and the author’s general adherence to that pattern in his own insights, I found it jarringly inconsistent when R. Meir quotes a Hasidic-style mystical explanation to a law. For example, the mystical explanation of cooking on Shabbos (pp. 381-382) seems entirely out of place in this book, as does the similarly mystical approach to the redemption of the firstborn son (pp. 717-719). 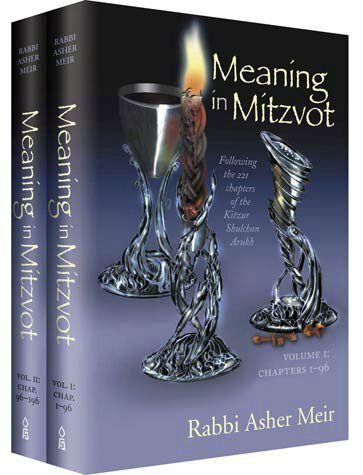 As an independent book, Meaning in Mitzvot has much to offer and would make an excellent introduction to Judaism for those wishing to become acquainted with traditional observance. 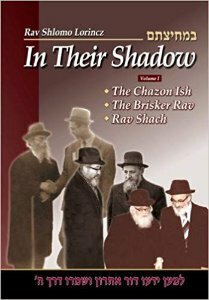 As a companion to the Kitzur Shulhan Arukh, the book becomes almost indispensable, adding flavor and reason to the Kitzur‘s intentionally dry list of laws.